When it comes to self-defense, pepper spray is one of the most effective, inexpensive, easy-to-use, and readily available weapons you can have. It is powerful enough to be used by law enforcement officers but is also widely available to civilians to ensure their own safety. When used correctly, pepper spray can be extremely effective against people and even attacking animals, and anyone can learn how to use it. It can certainly be intimidating to carry a weapon, even a non-lethal one, if you’re not used to it, so we’ve got the answers to all your pepper spray questions as well as our top 5 recommendations for pepper sprays that will give you the protection you need. This compact pepper spray earned our top spot because of its compact size, low price, high number of shots, and high-strength formula. It is designed specifically for runners or those who want to carry their spray while they are out, so it comes with a hand strap. The 10-foot stream spray range is great for a canister of this size, and there is a secure safety feature to prevent accidental discharge. Some users reported that the safety could get stuck or not turn all the way, but this was a very small number compared to the hundreds and hundreds of positive reviews. This unique pepper spray from Fox Labs was a very close second in our list of top picks. The Mean Green H2OC formula is one of the strongest on the market and contains green marker dye for easily identifying attackers. The number of shots and spray range are great for a product of this size, and you can find the Mean Green H2OC formula in larger sizes as well as in a fogger spray if that is your preference. 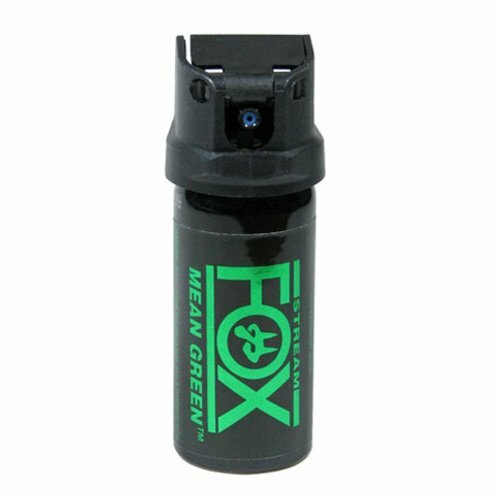 Fox Labs also uses a large nozzle opening so you get the maximum amount of pepper spray in each burst, making the Mean Green H2OC formula an extremely effective self- defense weapon. 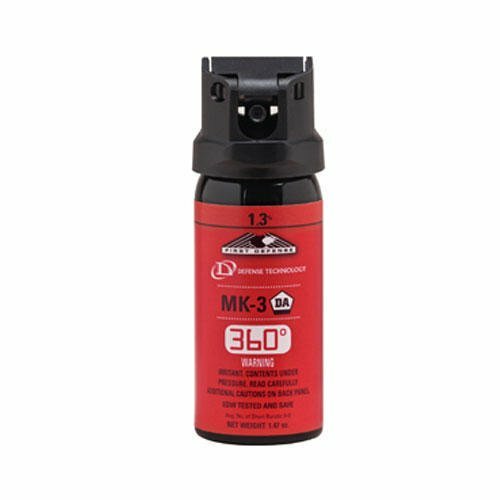 The largest drawback is that the 3-year shelf life is shorter than the 4- or even 5-year shelf life of most competitors, and because the company’s priority is to make sure customers have working products, they actually recommend replacing the pepper spray two years after purchasing it or after using it to make sure you have an effective weapon. 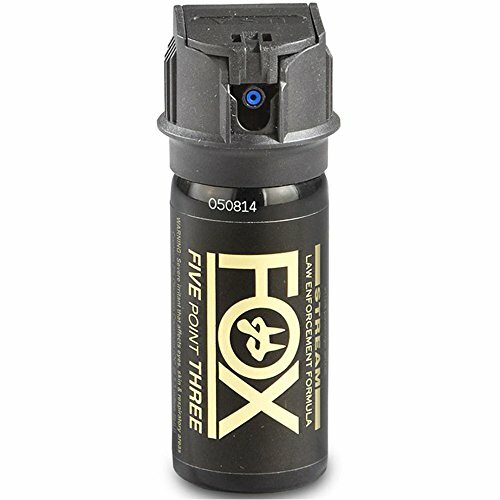 Another Fox Labs product made our recommendations list as an all-around excellent choice for pepper spray. The Flip Top Stream Spray has a longer-than-usual range of 17 to 20 feet without reducing the number of shots, though the trade-off is a slightly larger canister than our #2 pick. The flip top safety prevents any accidental discharge, and the high-strength formula, though not as hot as the Mean Green H2OC formula, includes invisible UV dye that shows up under black lights for easy assailant identification. Again, the Fox Labs shelf life is shorter than many other companies’, but other than that, the Fox Labs Flip Top Stream Spray has everything you need to look for in a pepper spray at an affordable price. The SABRE Red Pepper Gel was the only gel spray pattern to earn a spot on our list of recommendations. We wanted to include it because of the combination of SABRE’s hottest pepper spray formula with the longer range and minimal chance of blowback that the gel spray offers. It’s also the only spray on our list that would be good for indoor use. There is a flip top safety, and as with other SABRE products, there is a 4-year shelf life and UV dye in the gel formula. The canister is a tiny bit larger than other 2-ounce sprays, but a holster is included for ease of use. 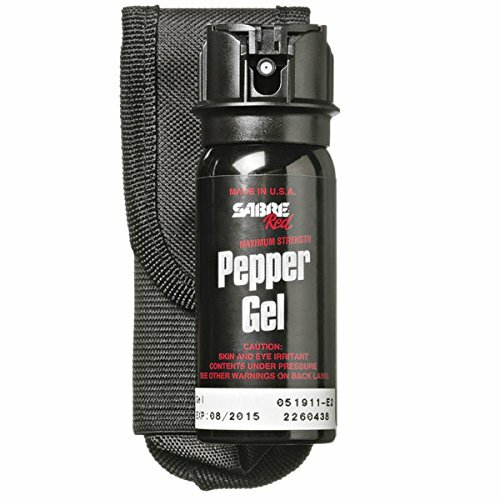 A gel spray pattern requires more precision, but in all other respects, SABRE Red Pepper Gel is a superior self-defense weapon. 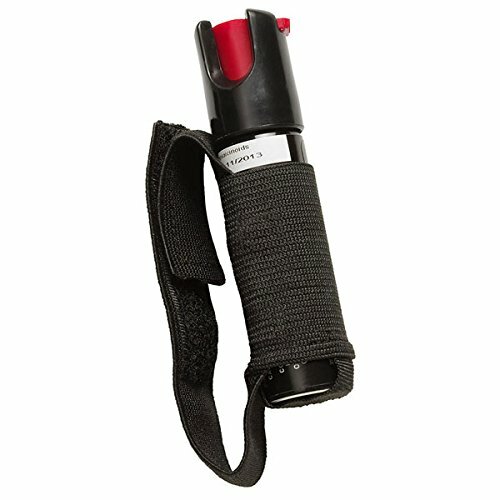 Defense Technology’s First Defense 360 MK-4 pepper spray edged out the competition to make it on our list of top picks. Defense Technology is a solid brand, and their line of pepper spray products includes a wide range of strength, size, and spray pattern options. We chose to highlight the 360 MK-4 Stream, which meets our expectations for high strength, multiple shots, and minimum spray range. Their greatest advantage, and the thing that brought them onto our list, is their 360-degree technology that allows you to be in any position when you deploy the pepper spray. Normally, a pressurized canister needs to be held upright to spray effectively; however, the 360 degree canisters will spray from any angle. To test this feature out, you can purchase a training canister (view on Amazon) for a little less than an actual canister of pepper spray. The canister is about 2 inches taller than all of the other pepper sprays on our list, which pushes the “compact” category, but the 5-year shelf life seals this as a pepper spray to consider. Which Pepper Spray is right for me? When choosing a pepper spray, in addition to the features listed above, you should consider how and where you want to carry and use the spray. Will you be taking it with you while you are jogging or walking the dog? Do you want something you can carry with you all the time in a purse or pocket? Are you looking for a spray that can be part of your home defenses? We’ve rounded up our top five picks for small, compact pepper sprays that can be carried around with you easily, with the note that all of them can be found in larger sizes if that is what you decide you need. What is pepper spray and what can it do? Because pepper spray affects the eyes and respiratory system, it doesn’t matter if your attacker is big or small—it will still hurt. The key is to make sure you know how to use the spray correctly and effectively. Some pepper spray companies have “inert” test canisters that will spray just like the real thing but don’t contain any of the inflammatory chemicals. If you are worried about using your pepper spray, you can purchase a test canister in order to practice, though they usually cost almost as much as the normal canisters. Many companies also offer video tutorials or written instructions, so be sure to review all training materials before venturing out with a new pepper spray. What should I look for in a pepper spray? Range: Pepper sprays with a longer spray range can protect you better than a spray that requires the attacker to be in close range. However, keep in mind that a longer spray range often means fewer shots overall. Number of shots: A canister with more shots allows you to use the pepper spray more than once, to use it against multiple attackers (if needed), and to fire a test shot once a year to make sure it is still functioning correctly. Please note that usually a shot is considered to be only half a second long, so even a pepper spray with 25 or 35 shots is only good for about 10 to 15 seconds total. A stream pattern has a liquid base and sprays a lot like a water gun. The greatest advantage is its range, which is generally around 10 feet. It’s best for outdoor use, and it’s less likely to be affected by the environment (like wind or rain) and turn back to hit you or anyone around you. The downside to a stream is that it requires some amount of accuracy to be effective. A fog pattern covers a wider area, which makes having correct aim less important and is great for protecting against multiple attackers. It also has a longer range of up to 25 feet and is the type of spray usually found in bear sprays. The risk is that you (and any bystanders) are more susceptible to being affected yourself, and the longer range means there are fewer shots in a canister. A foam pattern is better for indoor use and sprays like shaving cream. It is thicker and stickier than some of the other types of sprays, which reduces the chance of spraying unwanted targets. However, you do need to have good aim, and it doesn’t have a very long range—only about 4 to 6 feet. A gel pattern is similar to the foam but has a much longer range of 10 to 15 feet. Like the foam, it is ideal for indoor use and is quite sticky, so the risk of other people being affected by the spray is minimized. There is very little chance of being affected yourself, though you do need to have pretty good aim to use this one effectively. For our recommendations below, we mostly chose stream pattern sprays because of their range and because they’re less likely to blow back and affect you. However, if you decide you want to try out a different spray type, nearly every kind of recommended pepper spray comes in another spray option. Safety feature: The last thing you want is to deploy your pepper spray accidentally in your purse or pocket, or even just while handling the canister. A reliable safety feature to prevent accidental use is essential. Most pepper sprays have either a flip top or a sliding mechanism. In general, we found that a flip top is more reliable, but both types will work well. Size: The size you need will depend on where you intend to carry or store your pepper spray. If you want some to keep in a purse or to take with you while you go running, look for small, compact canisters that attach to key rings or have a jogger armband. If you want something to keep in your home, you can invest in a larger canister. Ingredients: Some sprays only contain OC, while others combine OC with other ingredients such as tear gas and UV dye to identify the attacker more easily. The UV dye is especially helpful and many products include it. The tear gas will add to the effects of the pepper spray, but if you have a high-strength spray, it really isn’t necessary, so we recommend finding a spray based on the OC strength rather than the extra ingredients. Legality: Pepper spray is legal in the United States in all 50 states; however, several states have restrictions set for the size/weight of the spray cannister, the type or amount of ingredients, how it is used, and who is allowed to purchase it and from where. Be sure to check your state’s laws before purchasing and adhere to any guidelines set by your state authorities. What is in Pepper Spray: How strong is it? Scoville scale: The Scoville scale was developed by a pharmacist to measure the spicy heat of chili peppers in Scoville heat units (SHU). Some manufacturers report this number, and while it’s a better indicator than just the OC percentage, it is the hotness of the raw pepper, not the overall spray formula. In general, look for sprays with at least a 500,000 SHU rating. Capsaicin and related capsaicinoids (CRC): This measures how many capsaicinoids are in the pepper spray ingredients, and this rating is regulated by the Environmental Protection Agency (EPA). It isn’t commonly reported, but if it is, look for a CRC rating of 1% or higher. Major capsaicinoids (MC): The MC percentage indicates the concentration of heat-bearing capsaicinoid chemicals within the spray, and it ranges from 0.18% up to about 1.33%. This is the best measure of the strength of a pepper spray, so look for an MC rating to confirm the strength of your spray. One more thing—what if I pepper spray myself? Get some fresh air. Leave the area to make sure you don’t continue to be exposed to the spray. Remove exposed clothing. If your clothes have come in contact with the pepper spray, get them off quickly and do everything you can to avoid additional contact with your face and skin. Flush your eyes. If your eyes are affected, flush them with cold water right away. If you are wearing contact lenses, get them out quickly and throw them away, and if your hands have pepper spray on them, ask someone for help. Blink rapidly to help flush your eyes out as well. Once your eyes are completely rinsed, and only then, put an ice pack on your irritated eyes to soothe them. Don’t rub your eyes, face, or skin. Touching or rubbing any areas that are reacting to the pepper spray will make it worse. If there is liquid pepper spray sitting on your skin, gently pat it off with a paper towel. Use whole milk to take out the sting. Milk won’t remove the OC oil, but it will reduce the burning sensation. Soak the affected area in a bowl of milk or place a towel soaked in milk over it. You can use milk to rinse out your eyes as well, but most experts recommend against it and say to use water or saline solution for your eyes. Use dishwashing soap to wash it off. Combine one part dishwashing liquid with three parts water to begin washing off the oil. Don’t rub it initially, but continue to soak or rinse the affected areas several times. Soak your face in a bowl of the mixture for about 20 seconds at a time, then change the water after each soaking. Keep rinsing all the affected areas until you can touch them without pain. Wash your hands thoroughly. Wash your hands several times and avoid touching your face until your hands are completely free of pepper spray contamination. While you don’t need to seek professional medical attention after being exposed to pepper spray, you certainly can and should if you are concerned about any long-term effects or if these methods aren’t working well. The important thing is to not panic if you find yourself the victim of an accidental spraying so you can treat yourself quickly. 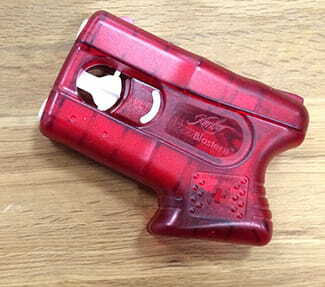 Pepper spray is a great self-defense tool that is widely available and easy to use. Be sure to check your local laws and regulations regarding pepper spray before purchasing any, and keep in mind the basic features to look for to find a high-quality spray that will work for you. Consider how and where you think you might need to use the pepper spray and select a size and spray type that fit your needs. Don’t forget to practice as much as you can to familiarize yourself with your new weapon to make sure you can use it effectively, though of course, we hope you never have to. Comment below to let us know if you’ve still got questions or to share your experiences, good or bad, with your own pepper spray.